Amit Ray has ever said, “Life is a manifestation of the unified field of consciousness. Colors, beauty, pleasure and pain are its songs of creation.” Right, our life composes of myriads of significant moments. 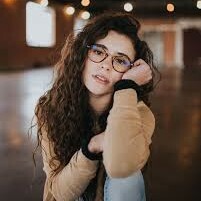 Those moments might be sorrowful or happy, plain or excited. Hence, it is really a good way for us to record them by digital camera. However, it is not convenient to watch those videos on digital camera. In this way, some people might think if there is any way to transfer video from camera to iPad for the convenience of watching videos. Of course, here I would like introduce two ways to transfer camera video to iPad. If you are looking for a good way to transfer video from digital camera to iPad, Apple Camera Adapter has a say. It can easily help you access and download photos/videos from digital camera to iPad. With this camera to iPad connector, you don’t need to worry that you can’t appreciate camera videos in a pleasant way. 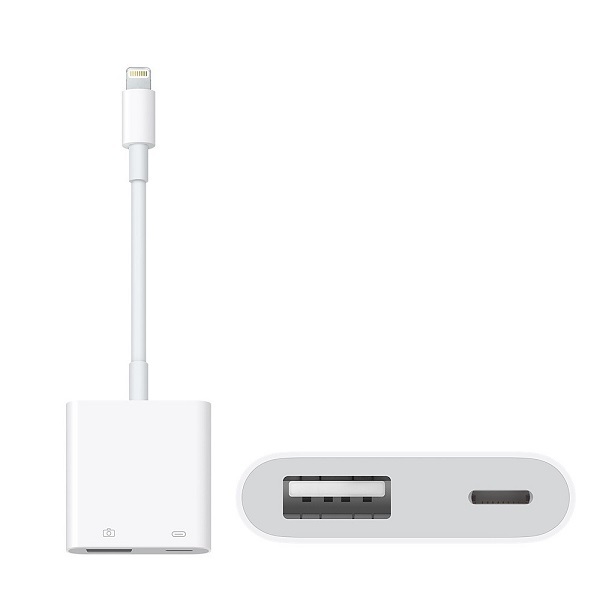 Generally speaking, Apple Camera Adapter includes: Lightening to SD Card Camera Reader, Lightening to USB 3 Camera Adapter, Lightning to USB Camera Adapter and iPad Camera Connection Kit. If you want to use this camera to iPad connector, you have to make sure you have latest iOS version on iPad. Now follow these steps to learn how to make video transfer from digital camera to iPad. 1. How to connect camera to iPad? First, you need to connect Apple Camera Adapter to iPad, then you can connect video camera to iPad by USB cable. Or you can insert SD card from digital camera. 2. Now open digital camera and make sure it is in the transfer mode. After that, open iPad and unlock it. 3. iPad Photos app with “Import” tab will automatically open. If it doesn’t appear, you can open Photos app and press “Import” on your own. 4. Here you can click “Import All” to transfer all videos from camera to iPad. Or you can select some videos you want to transfer and then tap on “Import”. 5. 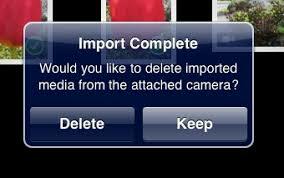 After it is done, a prompt will jump out to ask you if you want to keep or delete the media on the camera. If you want to save storage on camera, you can choose “Delete”. Otherwise, choose “Keep”. In this way, you transfer videos from digital camera to iPad. The best alternative to Apple Camera Adapter is Leawo iTransfer. This camera to iPad connector enjoys a super user-friendly and modern interface and superiors in transferring 12 kinds of files, including photos, videos, TV shows, podcasts, ringtones, etc. 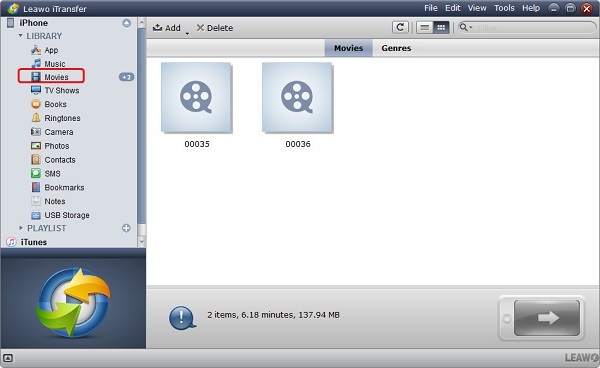 With it, you can also manage your iOS device files directly on computer. 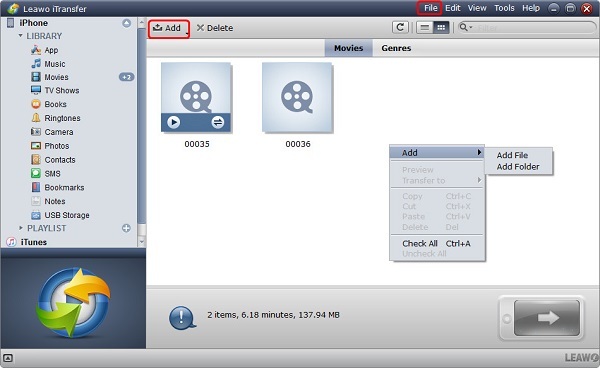 For example, you can delete duplicate photos, videos or contacts directly on the software. Or you can direct back up all your iPhone information to iTunes or computer. What’s more, the biggest advantage of Leawo iTransfer is that it can transfer purchased and non-purchased items, including purchased songs, ebooks and apps. Besides, it has free trial, but you can’t enjoy all its services. If you want to enjoy its services for a lifetime, you have to pay $29.95. How to transfer video from camera to iPad? The following guidance will teach you how. Remove SD card from digital camera and place it into SD card reader. Plug the SD card reader into the computer and connect iPad to computer via USB cable. After that, launch this camera to iPad connector. The software will automatically detect iPad. In the left sidebar, there are 12 different kinds of categories like photos, movies, TV shows, contacts, SIM, podcasts and so forth. In the right interface, iPad basic information like type, serial number, etc. is displayed. In the left sidebar, click “iPad > LIBRARY > Movies ” and you will see videos on your iPad. Click “Add” icon at the top middle or you can right click anywhere in the right interface to choose “Add > Add File/Folder”. In the pop-up window, choose videos from camera SD card to upload. Now the software starts to transfer video from camera to iPad. Your iPad will get videos in a couple of seconds. The above two methods are really efficient in making video transfer from camera to iPad. If you really look for a good solution, you can try them both. 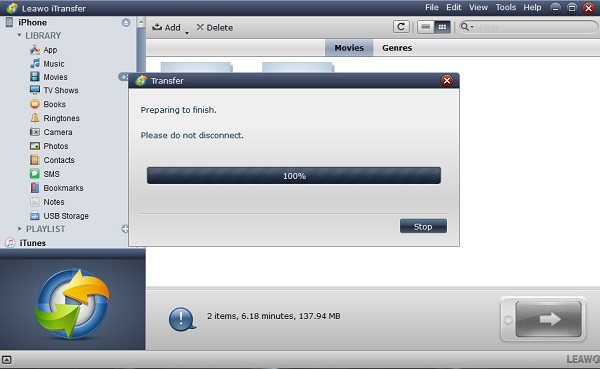 For Leawo iTransfer, it allows you to transfer many types of contents like photos, contacts, ringtones, SIM, e-books, etc. It is really a good choice to transfer camera video to iPad.